Customs duty on gold, silver and platinum was today hiked to 10 percent in third revision this year in a bid to curb the surging imports and burgeoning CAD, a decision that will also rake in an additional Rs 4,830 crore to the exchequer. While the duty on gold and platinum was raised from 8 percent to 10 percent, the levy on silver was hiked by 4 percent, according to the notifications tabled in Parliament by Finance Minister P Chidambaram. This is the third time that the government has raised the duty on gold this year with a view to containing its imports, mainly responsible for spurt in CAD which touched at a record high of 4.8 percent in 2012-13. The decision to raise duties follows announcement made by Chidambaram yesterday that government would take steps to compress the demand of precious metals, oil and non-essential goods to contain CAD at USD 70 billion or 3.7 percent of GDP in 2013-14. It was USD 88.2 billion or 4.8 percent of GDP last fiscal. Consequentially, adjustments in customs duties were being made on gold ore/concentrate, gold dore bar and silver dore bar. Pursuant to these changes, excise duty on refined gold bars produced from ores and concentrates and from copper smelting is being raised from 7 percent to 9 percent. Likewise, excise duty on silver manufactured from silver ore or concentrate, silver/gold dore bars or from copper, zinc or lead smelting is being increased from 4 percent to 8 percent. 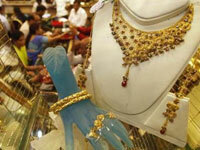 The government in January hiked duty on gold from 4 to 6 percent and later in June raised it further to 8 percent. Chidambaram had yesterday that one of the main challenges before the economy was to deal with the CAD, which is the difference between inflow and outflow of foreign currency, was USD 88.2 billion or 4.8 percent in 2012-13. A high CAD impacts the value of currency which in turn makes imports expensive and adds to the fiscal deficit.